Last Friday’s ‘Late Late Toy Show’ attracted the highest audience in the show’s 16 year history with an average of 1.4million viewers and am Irish audience share of 72% watching the full programme. Furthermore, 90% of the show’s target audience (4-14 year olds) tuned in to the programme. The show, which broadcast on Friday, November 26th featured performances and toy demonstration from over 150 Irish children, as well as performances by McFly and Joe McElderry. In a Toy Show first, host Ryan Tubridy sang the opening number ‘Pure Imagination’ to tie-in with the Willy Wonka themed show. This year’s live audience figures for the ‘Late Late Toy Show’ are the highest in 16 years – almost matching those of from December 9th, 1994 when the show attracted an average audience of 1,409,000 viewers. The ‘Late Late Toy Show’ also attracted 46,500 streams on RTÉ Player, up almost 120% on the figures achieved for the same period last year. 38% of these viewed streams were from users outside of Ireland, with 16% from the UK and 6% from the US. 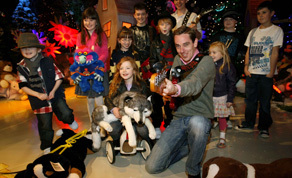 Going by the live audience and RTÉ player figures (compiled by TAM Ireland Ltd./ Nialsen TAM), the ‘Late Late Toy Show 2010’ is the number one most watched programme of the year-to-date on any channel available in Ireland.